Find stunning laminate flooring in Valencia, PA, at cost-effective prices from our locally owned flooring store. This simple and versatile flooring option is available in a multitude of colors, styles, and patterns. You are certain to find a selection that is perfect for your home or business. Lovely laminate is affordable, manufactured flooring that has durability built into its layers. 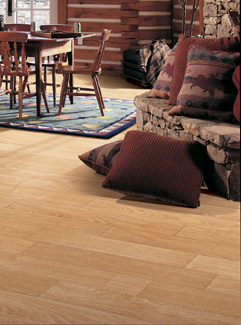 We offer laminate wood flooring and laminate tile flooring that mimics natural materials, but at lower prices. Visit our flooring showroom to see our large selection of laminate. The secret to laminate’s beauty and strength is in its layers. On top is a clear protective layer made of aluminum oxide. Next comes the design layer, which resembles hardwood, ceramic, or stone tile based on your selection. The core layer consists of high-density board to guard against moisture, while the bottom layer provides a strong and stable backing for your laminate floors. We believe in providing our customers with top-notch quality, which is why we offer laminate from the most reputable and well-known manufacturers. These are names which inspire trust and confidence in well-made and long-lasting flooring. Mannington™ - This manufacturer is known for the beauty and quality of its hardwood floors. Mannington has extended its reputation and knowledge to laminate, so the elegance of wood is reflected in this flooring option. HomeCraft™- This company manufactures laminate that complements your lifestyle. Easy-care laminate comes in a lovely array of faux wood with handsome finishes. Mohawk™ - Inspired by nature, flooring from this manufacturer has the patterns and tones that you find in fine hardwood flooring. Mohawk crafts its products so well that it is hard to tell the difference. Pergo™ - Expect realistic design and unmatched performance from this laminate flooring manufacturer. Pergo invented laminate floors 35 years ago and continues to innovate in design and quality. Shaw™ - The grainy texture of wood and its natural hues are what sets laminate from Shaw apart from other manufacturers. You have to touch it to make sure this flooring did not come from a tree. Armstrong™ - To make laminate look like real wood, Armstrong uses a special manufacturing technique, embossing in register. This adds depth and texture, while accentuating the design layer with the look of real hardwood. Now, that you have decided on the laminate for your living room, be sure to ask us for laminate flooring installation. We have trained flooring technicians on hand, who know how to install these floors correctly. Proper installation results in laminate that looks beautiful and resists damage. Why trust your floors to anyone but the experts? Our affordable flooring installation comes with a lifetime warranty – guaranteed. So, if you have problems with the installation, let us know and we will make it right at no cost to you. This is just one of the ways our flooring store differentiates itself from the rest. Do you want to learn more about the laminate flooring options available at our flooring store? Call our shop now at 724-602-4462 for additional information! We proudly serve the communities of Valencia, Mars, Bradford Woods, Seven Fields, and McCandless Township, Pennsylvania.